Jorddon Braaten #84 leads the way in track and State points. 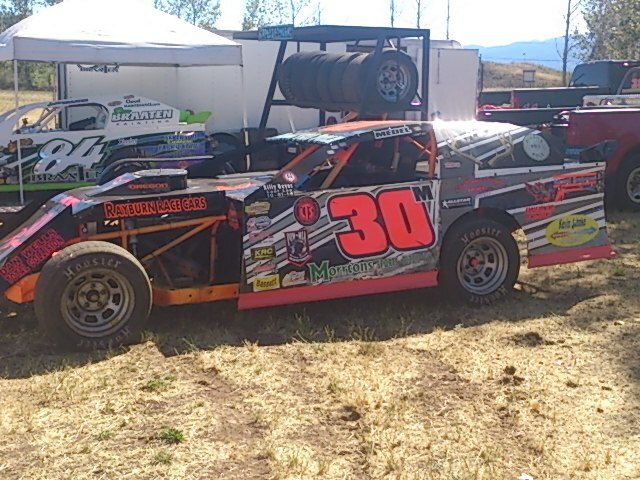 It is year #5 for the IMCA Sport Modified division at Southern Oregon Speedway, and this is their best year yet. Car count is up slightly, and there have been four different winners in the first five races this season. On Monday, July 4th, the IMCA Sport Modifieds will be part of a three division show that will also feature a professionally run fireworks display. It will be a great night for the family to come out and see a great show. Two time reigning IMCA Sport Modified champion Jorddon Braaten remains the man to beat. Though he has been running up front, the wins haven't come as quickly at Southern Oregon Speedway as they have in the past. Last season, Jorddon won the lion's share of the Main Events with eight victories. So far, he has two wins, along with a second and third place finish. However, he continues to lead the points at Southern Oregon Speedway and in the State of Oregon. Bob Nelsen #8n impressed with his feature win last week. Jorddon is enjoying the competition in the group. It started at the season opener, where he had to work hard to hold off two time track champion Dwayne Melvin and for that win. His next win came ahead of reigning IMCA State champion Mike Medel, who is still working for his first win of the season at his home track. Last week, Jorddon figured to be the winner once again, but he met his match in the form of Bob Nelsen. Nelsen had taken the lead from Glen Severson, and he held it until Jorddon passed him on lap 16. Nelsen held his groove on the outside and regained the lead a lap later on his way to victory. Rookie David Marble #4m has his sights set on a Main Event victory. The field includes Braaten, Medel, Nelson and Melvin, and these aren't the only drivers to keep an eye on. 2015 Mini Stock champion David Marble has been doing well in his rookie season. Last week, he had his best finish yet in third place, and there's every indication that he could be a feature winner at some point this year. Another rookie in the field among the top five is A.J. Parker. Parker brings a little bit of Kart experience into this, but this is his first foray onto the big track. He's been enjoying himself as he learns the process of running one of these cars. Also somewhat new to the scene is Parker's teammate Tony Bartell. Reigning IMCA State champion Mike Medel #30m is currently second in points. There could be some visitors coming in from California, and at the top of the list will be Yreka title contender Jimmy Lipke and two time Marysville Mini Stock champion Jimmy Ford. Ford is a winner of the Sport Mod race during the Lon Skinner Memorial event back in 2013. Visitors have left with wins on two occasions as Chico, California's Todd Cooper and California State Champion Fred Ryland each have a win. There is the possibility of a few other drivers coming in from down south, and they will meet some local drivers ready to battle for victory on the big stage. Willie McFall surprised Braaten last week when he held him off for a Trophy Dash victory. It was his first dash win in this division. Other drivers to keep an eye on include Glen Severson, who is coming off of a Top 5 finish last week. Randy Fernandez has had a rough start, but hopefully he will be back and faster than ever this week. Rich McCoy was fast the last time he was out there, but his motor let go on him during the Main Event. He is already a Top 5 finisher in his first start in the class. 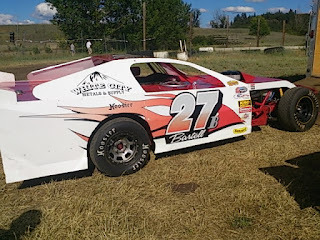 Tony Bartell #27b is one of the new drivers in the field this season. The IMCA Sport Modified is the affordable alternative for people wanting to go Modified racing who do not have the budget for a full Modified. They will find the competition close on the race track and very exciting. The fans will enjoy the show that these drivers put on. Sport Modifieds are bringing it to the track this Monday along with Valley Boys Auto Sales Outlaw Pro Stocks and Southern Oregon Dwarf Cars. If that's not enough, there's a Fireworks Display. Monday night is sure to be a great show.